Intel wants to make the whole Web editable, just like a single Wikipedia page. The chip giant on Tuesday will make a beta available of Intel Mash Maker , a free browser extension that allows users to modify Web pages and combine information from different sources. Its first beta works with Firefox 3 and Internet Explorer 7, though at this point the features are far more mature in Firefox, Intel said. 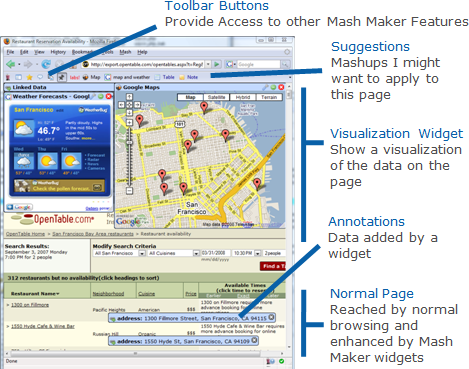 The product, which originated in Intel's research labs, is similar to existing mash-up tools like Yahoo Pipes and Microsoft Popfly in that it has a graphical design tool. We're trying to change the nature of what the Internet is, where it's not a collection of pages, but a collection of information. And we want to allow users to collaboratively choose how they see that information. Communities Dominate Brands - Wow. Blog Grande Je suis certifié sur votre blog Parce que j'ai cherché et visité le contenu de blog sont uniques. Si votre blog ne sont pas uniques message pour que je ne poste mon commentaire.